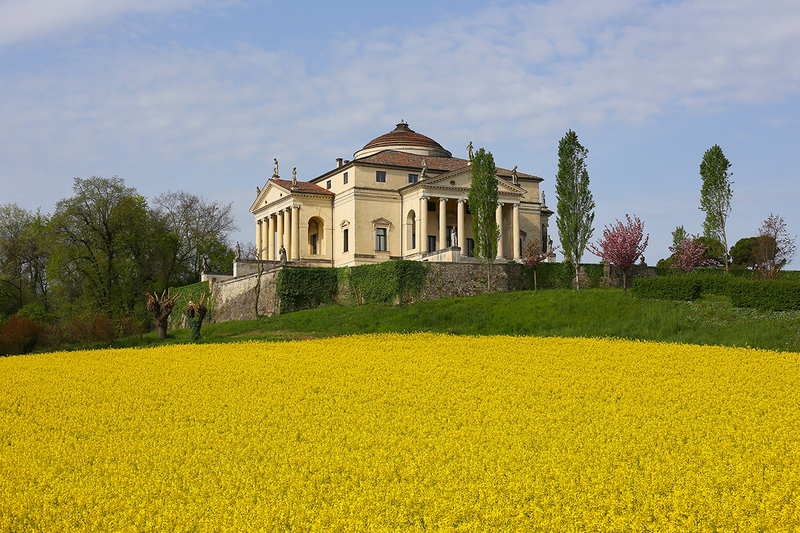 Built around 1570 for the prelate Paolo Almerico, referendario apostolico of the Popes Pio IV and Pio V, La Rotonda – without doubt the most famous creation of Andrea Palladio – is an original example of a prelate’s villa. It differs from all Palladio’s buildings – in fact, it is not developed on a longitudinal plane and it is also the only one crowned by a cupola (which appeared hemispherical and more emergent in the original map). It is also its intended purpose that differentiates La Rotonda from the other venetian villas of the second half of the sixteenth century – it’s a suburban mansion, refined meeting point for the aristocrats of Vicenza, a place of amusement and “literary idleness.” The Capra family, that acquired it in 1591, commissioned to Vincenzo Scamozzi the adjacent buildings which would be assigned to agricultural life. In this villa, designed for a prelate, Palladio introduces some formal elements aimed at suggesting a sense of sacredness. Palladio was probably inspired by the roman Pantheon, which was once called “Rotonda”, and chose the classical theme of the “sacred space” that results from the contamination between the different formal models of the circle and the square, of the cube and the sphere. Palladio opts for a central plan, crowns the building with a cupola, and repeats the classical pronao four times, thus realizing a “villa-temple” that celebrates the prestige of the client and his important position beside the Pope. 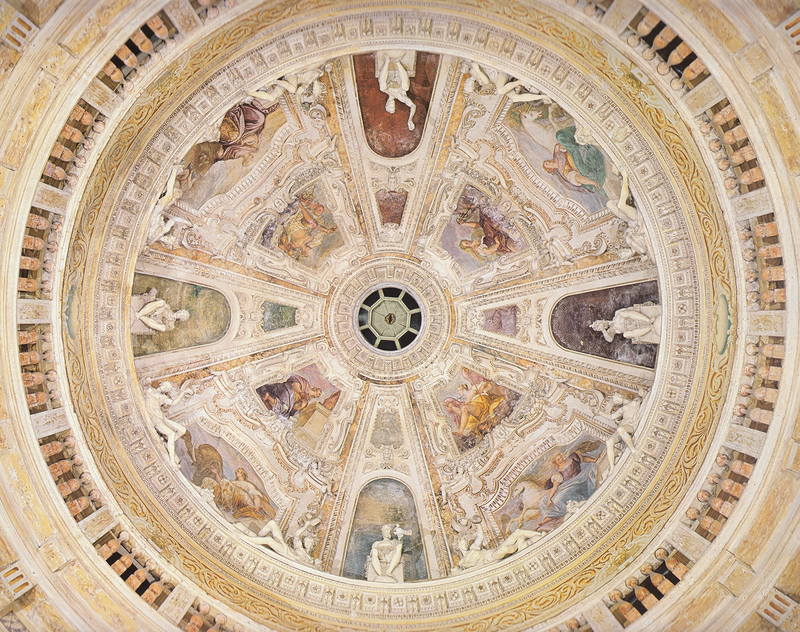 The sixteenth century frescoes, by Alessandro and Giambattista Maganza and by Anselmo Canera, also seem in line with this celebrative intent by including many Allegories connected to the Virtues of religious life. In the cupola, for example, Religion, Benignity, Moderation and Chastity are represented (next to Celebrity). 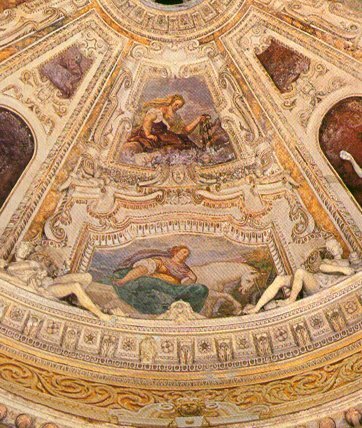 Moreover, the west Room was named “Room of Religion” due to the main subject of the ceiling frescoes, while the apologetic Allegory of Paolo Almerico, crowned from Celebrity and surrounded from Fidelity, Affability, Persuasion and Europe (symbol of the reason oriented towards divine things) can be found in the east Room.